I have seen individual or incomplete sets of these over the years, this is a complete set of twelve polished pewter figural / novelty knife rests, all different pairs of animals. The underside of each is signed Etain D'art / Titre Legal / Made In France; these date from the Art Deco period, circa 1930. The animals are as follows: Cats / Geese / Monkeys / Squirrels / Snails / Elephants / Goats / Swans / Cockerels / Fish / Pheasants / Lobsters. They come in a box (I don't think the original); the box measures 11" x 7" x 2"; each knife rest measuring 4 1/2" x 7/8" x 1 1/2" tall. Item ID: 40689. 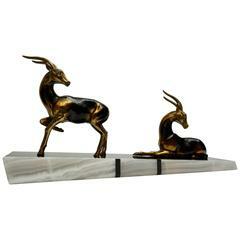 French Art Deco style patinated metal deer sculpture on onyx base. Possibly Art Deco period. Measures: Width 48 cm. height 25 cm.